If you’ve perused the Internet in the last little while, you’re probably aware of the rumors of Apple’s “iRadio” service—a streaming music service that would (if it became real) provide Pandora-like functionality to computers via iTunes, as well as to iOS devices. Such rumors naturally provoke questions: If such a thing existed, how would it differ from Pandora and other streaming services? And given that Pandora and its ilk do exist, what can Apple bring to the party that isn’t already there? Let the conjecture begin. Let’s first clarify what kind of service we’re talking about. Currently there are two commercial music streaming models. The first is a Pandora-like service, where you have no choice over the specific tracks you listen to, but rather you create stations based on particular songs, artists, and albums you enjoy. By rating the music streamed to you with a simple thumbs up or thumbs down, you fine-tune the station to the point where everything you hear is, at the very least, tolerable. At best, it’s familiar music you love and unfamiliar music that you’ll cotton to. Pandora is the service to beat in streaming radio. The other model is on-demand streaming. This is practiced by such services as MOG, Rdio, Rhapsody, Slacker, Spotify, and Google’s All Access. With these services you can choose specific tracks, albums, artists, and genres to listen to. They also let you create playlists and download tracks to mobile devices. Additionally, each offers a feature similar to Pandora where you can stream stations or channels based on a selection—an artist or genre, for example. 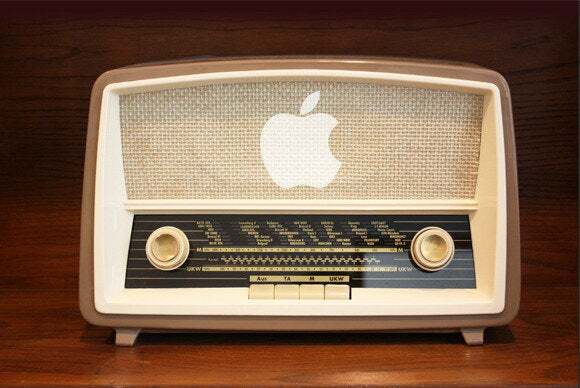 All rumors of Apple’s service have pointed to radio rather than on-demand streaming. And that leads some people to wonder why, when Google has jumped into on-demand listening and Spotify seems to be getting ever-greater attention, Apple would take what appears to be the less interesting path. The truth is that the on-demand market is getting a little crowded, and there’s not a lot that differentiates each service. They all have enormous catalogs and provide the ability to share playlists with other people to varying extents. Although I’d love it if Apple were to offer on-demand streaming (because I think the company would do it well), I’m not sure it makes sense for the company or the music labels. And the labels are an important component in this scheme. They may feel that it’s in their interest to agree to an Apple-hosted radio service rather than on-demand access. 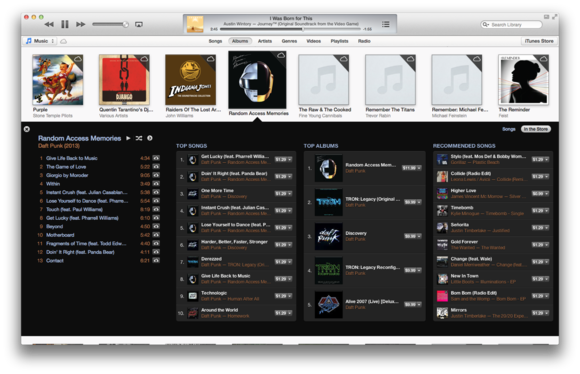 Currently, few would dispute that the iTunes Store remains The Place to go for purchasing digital music. As such, you can understand why the labels wouldn’t care to weaken such a lucrative storefront, as might happen if on-demand listening turned out to take listeners by storm. What they gain in steady income could be offset by fewer sales, particularly of blockbuster albums. (You can also imagine that, given how little money streamed music generates for artists, some important artists would choose to opt out of such a deal.) The labels and artists would, however, love nothing better than for the iTunes Store to provide greater exposure to the music in their catalogs. A radio service can do that. Play a particular channel, and, as with Pandora, music that you’re likely to enjoy emanates from your speakers or headphones. Oh, and look, there’s a Buy button, front and center. Click. Purchased. Done. Oh, you purchased that? Let’s rejigger the upcoming playlist to include tracks you’ll like so much that you’ll pay for them. Pandora can do something similar, in that it too features a Buy link. But it requires more steps, and its catalog isn’t nearly as large as what Apple should be able to offer. Having such a service built directly into iTunes gives Apple a leg up. And speaking of a leg up, there’s iTunes’ Genius feature. With Pandora you must choose a source and then train the service. (Not from the ground up, as Pandora has plenty of data from other listeners it can use to make very educated guesses about what to serve you.) But suppose Apple’s service has access (with your permission) to all the tracks you’ve purchased, all the tracks in your iTunes library, and—for those who’ve chosen to use the service—everything you’ve done with iTunes Match. That data is compared with the Genius data of others who have similar tastes. Imagine how close the music you hear could match your tastes—and, again, from a much larger pool of music. The Genius data shared with Apple could help create some great stations. And then there’s the question of paying for the service. Pandora, Last.fm, and Slacker offer free plans that are subsidized via both audio and visual commercials. This approach doesn’t sound like Apple to me. The company’s image is very much about quality, and to tacitly endorse an insurance company, sugar-water manufacturer, or bourbon distributor by slapping on their jingle-laden ad would run counter to that image. Visual ads within the player make more sense—particularly if they’re for companies such as BMW, Rolex, and Nike, where the brand’s perceived quality matches that of Apple’s. Still, given the nature of a music player, users spend very little time looking at the screen and so will miss many of the ads, which makes them less valuable to advertisers. This puts Apple in an interesting position regarding ads: Should it please the customer who wants no audio ads whatsoever, or please the advertisers and risk losing those customers. Likewise, I can’t believe Apple would offer streams crowded with DJs, which would be the worst sort of audio skeuomorphism. Of course, Apple could follow Pandora’s lead and offer two iRadio services—an ad-supported version and an ad-free subscription version. The latter could be manifested as part of the iTunes Match service, or offered as a separate add-on. Make the ads in the former just intrusive enough (and the paid service affordable enough), and watch the subscriptions roll in. iRadio, rather than being Pandora’s me-too clone, offers opportunities for all parties involved. We, the listeners, get more finely tuned stations, based on the music we own from a deep catalog of tracks; the music labels expose and target their wares to a broader audience (and likely make a decent amount of money for streaming their content as well as selling it); and Apple creates another compelling case for owning devices that can take advantage of the service. This one will be interesting to watch. While it’s possible Apple could roll it out as early as next week’s Worldwide Developers Conference, it seems more likely to appear in the fall, when the company traditionally makes a big push on media and music products. Keep your eyes peeled.